Lili Almog, Video Portrait #3, 2007, still from a color video, 2 minutes 40 seconds. The Mosuo people, a populace that has surrounded China’s Lugu Lake for hundreds of years, have no word for war, but they do have Levis and Adidas. The women of this matriarchal society are one of the minority groups represented in Lili Almog’s latest exhibition and book, part of the Israeli artist’s ongoing investigation into female identity. Referencing a quote by Chairman Mao, “The Other Half of the Sky” reveals the cultural paradox of today’s rural China through portraiture. Ancient customs and modern tastes compete in the richly textured photographs. Like the flash of blue jean beneath a religious gown, the exhibition is filled with surprising details. At first glance, a group of four screens seemingly presents a slide show of still images; on closer inspection, the stoic figures animate—a subject blinks or wets her lips, a chicken wanders through the scene. 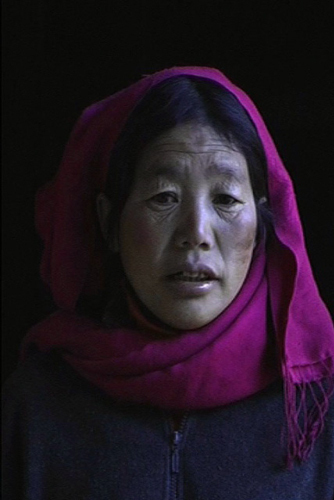 Though discrete works, these “video portraits” suggest broad paradigmatic shifts of tradition conceding to modernity. The cracked face of an elderly woman is projected alongside that of a young girl, as if the former had miraculously morphed into the latter. Almog conceived the project in six geographic sections: mountain, lake, factory, street, backyard, and land. Fittingly, it is the landscape which most aptly thematizes the dilemma; the artist cogently captures her subjects at sites of literal transition—atop factory rubble or at the intersection of land and water—holding up their half of the sky.